ImageNet is the most well-known dataset for image classification. Since it was published, most of the research that advances the state-of-the-art of image classification was based on this dataset. Although there are a lot of available models, it is still a non-trivial task to train a state-of-the-art model on ImageNet from scratch. In this tutorial, we will smoothly walk you through the process of training a model on ImageNet. The rest of the tutorial walks you through the details of ImageNet training. If you want a quick start without knowing the details, try downloading this script and start training with just one command. The commands used to reproduce results from papers are given in our Model Zoo. Since real training is extremely resource consuming, we don’t actually execute code blocks in this tutorial. We assume readers have a basic understanding of Gluon, we suggest you start with Gluon Crash Course . Also, we assume that readers have gone through previous tutorials on CIFAR10 Training and ImageNet Demo . Unlike CIFAR10, we need to prepare the data manually. If you haven’t done so, please go through our tutorial on Prepare ImageNet Data . Training deep learning models on a dataset of over one million images is very resource demanding. Two main bottlenecks are tensor computation and data IO. For tensor computation, it is recommended to use a GPU, preferably a high-end one. Using multiple GPUs together will further reduce training time. For data IO, we recommend a fast CPU and a SSD disk. Data loading can greatly benefit from multiple CPU threads, and a fast SSD disk. Note that in total the compressed and extracted ImageNet data could occupy around 300GB disk space, thus a SSD with at least 300GB is required. Finished preparation? Let’s get started! First, import the necessary libraries into python. In this tutorial we use ResNet50_v2, a network with balanced prediction accuracy and computational cost. 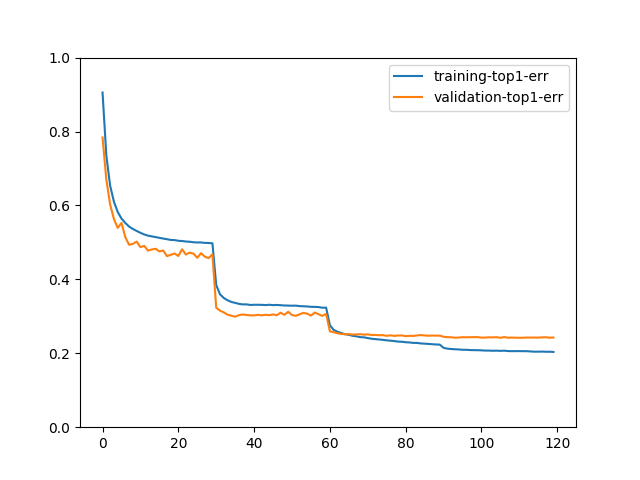 Note that the ResNet model we use here for ImageNet is different in structure from the one we used to train CIFAR10. Please refer to the original paper or GluonCV codebase for details. When training a small network with multiple GPUs, data IO could be a bottleneck for the performance. Besides data loader from gluon, we recommend to use the ImageRecordIter interface to load and process data from record files. For more information on record files, please refer to our tutorial. Data augmentation is essential for a good result. We can set related parameters in the ImageRecordIter . Since ImageNet images have much higher resolution and quality than CIFAR10, we can crop a larger image (224x224) as input to the model. It is important to keep the normalization consistent, since trained model only works well on test data from the same distribution. The above code works as data loader, thus we can later directly plug them into the training loop. Note that we set batch_size=256 as the total batch size on 4 GPUs. It may not suit GPUs with memory smaller than 12GB. Please tune the value according to your specific configuration. Path '~/.mxnet/datasets/imagenet/rec' is the default path if you prepared the data with our script. Optimizer is what improves the model during training. We use the popular Nesterov accelerated gradient descent algorithm. With 1000 classes the model may not always rate the correct answer with the highest rank. Besides top-1 accuracy, we also consider top-5 accuracy as a measurement of how well the model is doing. At the end of every epoch, we record and print the metric scores. At the end of every training epoch, we evaluate it on the validation data set, and report the top-1 and top-5 error rate. Model Zoo provides scripts and commands for training models on ImageNet. If you want to know what you can do with the model you just trained, please read the tutorial on Transfer learning. Besides classification, deep learning models nowadays can do other exciting tasks like object detection and semantic segmentation.